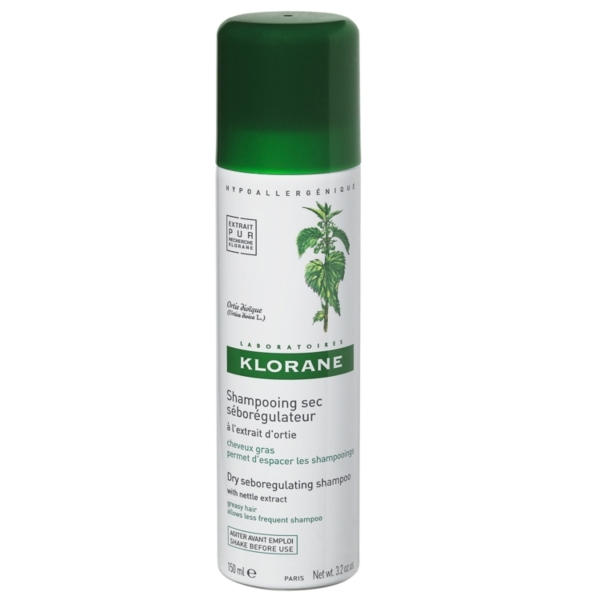 Klorane have a new addition to their range; a dry shampoo that actually helps to regulate sebum production! This is great news for anyone (like me!) who suffers from oily roots but normal/dry lengths. Using a dry shampoo eliminates those unnecessary hair-washes that you only do because the roots feel a bit dirty – it also works brilliantly as a styling product, adding lift and volume to the roots of the hair. If it takes you ages to style your hair each time you wash it, then dry shampoo allows you to go a little longer between washes, meaning less time styling. I have used Klorane’s original oat milk dry shampoo for years (it’s a favourite in every hair stylist’s kit-bag) but I actually think that the new nettle formula is much better suited to my scalp. Used yesterday on reasonably oily roots, it has completely absorbed any grease and my hair actually looks better today than it did yesterday! The lengths look shiny and healthy and there’s a slight ‘bounce’ to my hair that I find quite difficult to achieve usually. When using dry shampoo, be careful not to spray it directly onto the scalp – you’ll just end up with big white patches, and they’re impossible to brush out! Adam Reed (session stylist and of Percy and Reed salon) recommends spraying a paddle brush with dry shampoo and then brushing through from the roots. I find that spraying my fingertips is also effective, but if you really must spray directly into the hair, then make sure you hold the can at least 10-12 inches away from the scalp. Start at the nape of the neck, so tip your head upside down. Separate the hair into sections with your fingers so that you spray at the roots and not all over the lengths, then immediately brush through to distribute the shampoo. Most say to spray and then leave for a few minutes for the oil to be absorbed, but I think that’s when you tend to get a patchy white effect – or worse, weird clumps of product! Klorane have just relaunched all of their products into John Lewis exclusively – no longer at Boots. If you found stock in Boots to be a little sporadic, then rest assured that John Lewis will have a good, constant supply. Good old John. Klorane Nettle Sebo-Regulating Dry Shampoo is £7.50 from John Lewis.